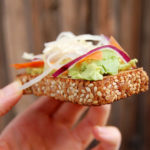 Toast a couple pieces of bread and spread hummus on one piece and avocado on the other piece. Pile on the rest of the ingredients in any order you like. You can put some ingredients on one piece and others on the other piece. You can mix and match and make each piece different. Fancy toast isn’t a science, it’s a delicious art. Have fun with it and then NOSH!